Salamba Sarvangasana is better known as the Shoulderstand. Sa means with, alamba means prop,so salamba means supported. Sarva is all, whole, entire, complete. Anga is limb so Sarvanagasana means all the limbs and the pose benefits the whole body. This posture is also known as the Mother of all the asanas. 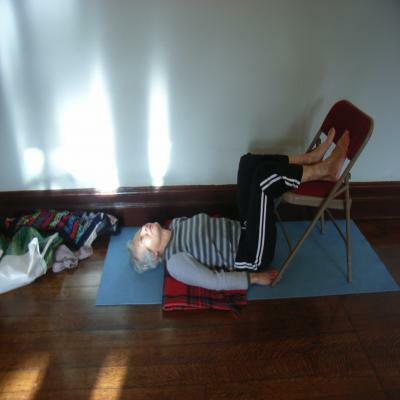 Iyengar tells us that just as a mother strives for harmony and happiness in the home, so this posture strives for harmony and happiness of the human system. The shoulderstand enables the thyroid and the parathyroid galds to function more efficiently. It helps reduce the size of varicose veins. It can help headaches, it can improve the digestion systtem. It also helps many women's problems. Iyengar tells us that it brings new life and the mind will be at peace and the yogi will feel the joy of life. Even raising the legs as shown in the picture will benefit the body. It is not chance the doctor tells patients to put their legs up! Warning Do not hold this posture if you are menstrating. Do not attempt the posture beyond the one shown with Eve where the legs rest on a chair, if you have glaucoma or detached retina. You can do this posture if you have high blood pressure but ONLY if you have done Halsana the Plough posture first and you can do the Plough posture for three minutes. So beginners with high blood pressure, avoid this posture. Eve had severe osteoporosis and was very fragile. She loved lying on the floor with her legs on the chair. Note how Eve had her upper back supported on a blanket. This student has placed her blanket so that her shoulders are on the blanket but her head is on the floor. There is no weight on her neck. Her chin should be slightly more vertical. Blocks which are higher would have been better for her to use and her shoulders could have been a little further on to the supporting blanket. 2. The more generously endowed you are, the higher your support should be. So if you are a 38 E cup, use two or even three blankets to lift you up. 3. Your shoulders need to be close to the edge of the support. Your arms as far as and including your elbows should all be on the support. Your neck should be such that your airways are open. If you have done First Aid and have worked with the doll, you will know you have to tip the head back a bit to be able to get your breath down into the chest of the doll. It is the same for shoulderstand. If you are going to develop this posture so you can hold it for five, ten, twenty minutes you need to be able to breath easily. Many people have heard about the chinlock and want to achieve this by bringing the chin to the chest. No, no, no! One day the body will be strong enough to lift the chest towards the chin. When you first start practising shoulderstand, even if it is only like Eve with your feet up on a chair, ask a partner to check that they can put their fingers underneath your neck. In class, a good teacher will check every student's neck to make sure they haven't got any pressure on their neck. Sometimes it is possible to see the gap and then the teacher may not check but do not be surprised if the teacher tries to put his/her fingers under your chin. If they can't manage it, they will tell you to come down immediately. Do so, the teacher will come back and show you how to do the posture again once the rest of the class has been checked. OK so you have raised your upper back on to a support. What next? Absolute beginner and pupils with osteoporosis or painful backs. This is too easy, you want to do more? Catch the legs of the chair and pull the chair towards you while bringing your feet to the edge of the chair seat nearest you. Push with your legs and let your bottom come up off the floor and rest on the edge of the chair, while taking your legs to lie over the chair back. Still to easy and want to progress further? Can you lift your bottom up on your own? Some of us curl ourselves up a bit and then almost rock and roll back to take our legs over our head and then gradually lift the legs more vertically. Yes, you should be able to just lift your legs up and your abdominal muscles should be strong enough to let you do this, but not everybody can to start with and some of us never get to that stage. It does not mean we can't benefit from the posture. If the slight curl and rock backwards doesn't work and you feel grounded, go and sit next to a wall, with your bottom as close as possible to it. Lie back. Put your feet on the wall above you so that your lower legs and your thighs are at right angles. Push your feet against the wall and usually your bottom will start to lift off. Keep practising until you can lift your bottom up easily. 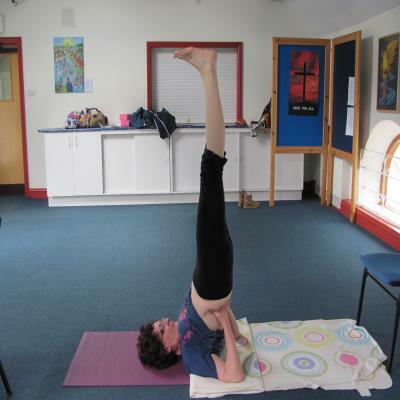 This will strengthen the muscles needed to take you into sarvangasana. 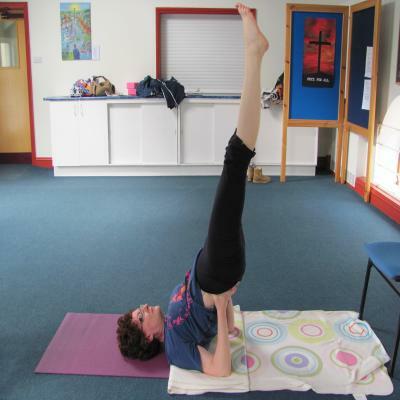 Getting to a straight salamba sarvangasana. If you have a partner, ask them to tell you how you can move your legs and bottom to achieve the straight pose you should be seeking. It helps to bring your elbows in and to put your hands on the small of your back and give the back a feeling of lifting. The closer you bring the elbows together the better your posture tends to become. See how much straigher the pose is on the right hand side. Imagine you are holding a large book on your feet. This will stop your feet twisting and ensure the stretch in the legs is even. As you improve your chest will lift upwards and nearer and nearer to your chin. One day the chinlock will happen. But do not force it. The student in the photo above is not there yet. The posture should feel light and effortless. Imagine you are being drawn up to the ceiling. Ladies, funny sounds when you are upside down? Ladies if you can feel something lifting up and down in your women's parts when you are in a shoulderstand and you can make a sound when you lift this bit, you may well have a prolapse. Do please go to the doctor and get it checked.